The land surrounding Shaker Village in Kentucky might have been pulled fresh from the pages of one of J.R.R. Tolkien’s tales. It encompasses rolling hills, small farm buildings, pleasant forests and streams, and ’round about its many pastures are dry stone fences that have stood for centuries. In a few spots along these fences, those who built them creatively worked round portals into the stone so that one could stoop down and see through the fence to the pasture or roadway beyond. Passing one of these curious spots on a walk the other day, I was reminded of a tale I once heard regarding them; or at least, regarding one of them in particular. It was told me by a local fellow — Michael, I think his name was — in the Trustees’ Hall one night when Lorraine and I were supping there. It was a curious story about a very young woman who worked in Harrodsburg, but who dearly loved Shaker Village. She had no real family (Michael thought she might have been an orphan), and she had moved to Kentucky because…well…because the countryside here simply called out to her. And she loved taking long walks through the Village, never minding if there were reenactments going on, or festivals, or hayrides, or even Elves and Hobbits strolling the dusty paths until late into the evening. Her name was Wendy. She was a quiet, introspective soul, and she managed to eke out what little living she required by working at a local print shop. The proprietor was quite kind; he seemed to understand her love of the Village, so he often let her off work early so that she could hike the wild trails there. 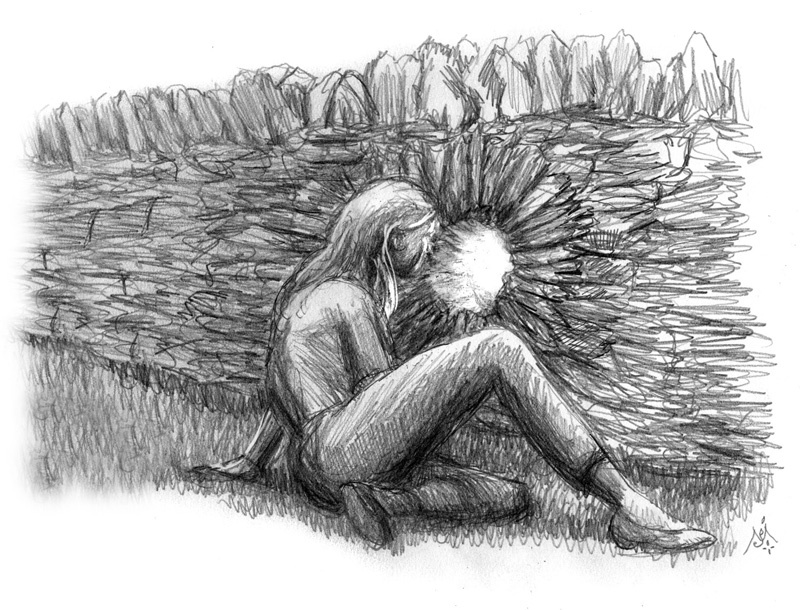 All was well with Wendy until, on one particularly chilly October afternoon, she was strolling away from the Village beside one of the dry stone fences, and she came upon one of the round portals that I have mentioned. And it was only then, and perhaps only because of the peculiarity of the weather at the time, that she noticed a curious thing: although the day was chilly, overcast, and damp, the light shining through the portal was bright and golden. It struck her as quite odd. Puzzled, she knelt down and peered through the opening in the stone wall; and at that moment, her life was changed forever. For, you see, there on the other side of the wall, Wendy saw, just as clearly as you or I might see the sun rising on a clear winter’s day, a young woman looking right back at her. The girl was dressed in unusual garb, as if she was one of the costumed folk that sometimes attended festivals in the Village, but she seemed just as startled to see Wendy as Wendy was to see her. “Hello!” the young woman replied. At that point both of the young women did exactly the same thing; they stood up so that they might speak to each other over the top of the fence. But that is also when they received a shock. For, as Wendy stood and peered over, all she could see on the other side was damp pastureland rolling gently away from the road. There was a bit of fog and a donkey in the distance, but no other living thing, and certainly not a cheerful-looking young woman wearing a cloak. “How can you be there? !” asked Wendy. “Why can’t I see you over the fence? !” the other young woman asked. They both then promptly stood up to look over the fence once more, suspecting some sort of illusion or, in Wendy’s case, that she must be asleep and having the strangest sort of a dream. But, nothing had changed; the pasture and the donkey were still there. And although she could actually lean over the fence and look down at the grass directly below it on the other side, there was no young woman hiding at the base of the stones. She stooped down for a third time, and the other girl was back. “What’s your name?” Wendy asked her. “Well, how are you managing this trick, Wendy? Or am I just dreaming? I suspect that the mead my brother gave me at dinner must have put me sound asleep, and that you are just a fairy tale spun of herbs and honey….” Rowena’s voice was sweet and musical. Wendy was disconcerted by the girl, who appeared to be near her own age, or perhaps a bit younger, but she liked her immediately. If you have ever encountered someone in your life to whom you took an instant liking, but you didn’t exactly know why, you’ll know how Wendy felt. Even though Rowena had something like an English accent (to Wendy’s ears, at least), and she seemed to be wearing an outlandish outfit, Wendy thought suddenly that this sudden tug of affection must be what it felt like to have a sister of her own. Rowena stood up for a moment and the space in front of the portal was left open. Beyond the fence, Wendy descried golden pastures, not unlike those she might have seen over her own fence, but in Rowena’s world it was sunny, and the sky was a clear, deep blue; there also appeared to be sheep grazing in the distance. After a few moments, Rowena’s face reappeared. Wendy stood and looked to her right. There was no cart coming. The road was empty and muddy. She stooped back down again. “Certainly! We’ve had not a bit of rain for two weeks!” Rowena laughed musically. This entry was posted in Uncategorized on October 17, 2014 by admin. Fun! I eagerly await installment 2.